A German firm is due to reveal a new tech that could help defeat counterfeiters who steal business from big name tech firms like Apple–the clever chips are fingerprinted in a way that makes them physically uncopyable. German researchers are due to reveal a new tech that could help defeat counterfeiters who steal business from big name tech firms like Apple–the clever chips are fingerprinted in a way that makes them physically uncopyable. The Fraunhofer Institute for Secure Information Technology plans to reveal the innovation at the upcoming Embedded World conference. It’s a kind of electronic fingerprint that’s embedded into official chips so that they gain “physically uncloneable functions” (PUF)–by locking down the device’s functions to PUF verification, it prevents replication of the actual chips themselves. 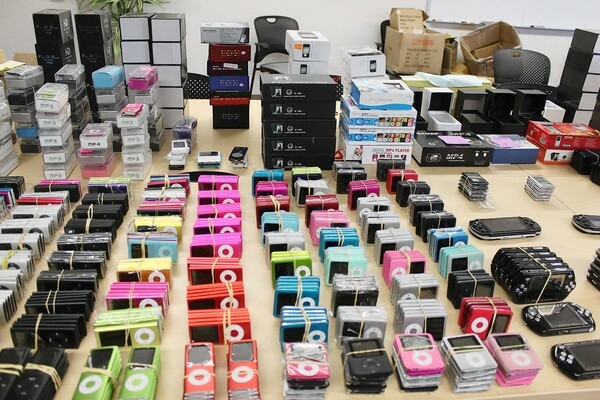 This week authorities confiscated thousands of fake iPhones, iPods, and other electronic devices worth over $10 million as the result of an investigation into a counterfeiting ring in Los Angeles. The image of the fake devices, above, is pretty staggering. Counterfeit devices can go far beyond aping the look and feel of the device they’re cloning, and manufacturers even go so far as to employ scanning electron microscopes and advanced laser tech to work out details at a silicon-chip level. Anti-counterfeiting technology exists (and “fingerprint”-style chips have been tried before) but is no match for this level of sophistication. Which is where the German tech comes in. Although electronic components roll off production lines in fab plants by the million and billion, and they’re notionally identical down to microscopic levels, each device is actually subtly different. Vanishingly small differences in the production of silicon chips, for example, results in failed units on every silicon wafer produced–the “yield” measure tells you how accurate the production is. AMD even used the trick to produce triple- and quad-core CPUs that were actually built using six cores, but the “failed” cores–casualties of production errors–were disabled. It’s these subtle variations in production that can be used to make a PUF fingerprint. A super-accurate measuring system is built into the PUF tech, and it can detect the individual characteristics of a device’s circuit–sampling the unique variations in the components, and generating a unique code. The code is then passed to the device’s operating system and enables it to run–but it’s a secure process because the code is not stored anywhere, instead being generated on the fly, making it much harder to intercept and copy. Direct interventions to try to clone the components would also alter the physical character of the chips, rendering them inoperable because their fingerprint is altered–again a deterrent to would-be cloners.